An ultracentrifuge that separates cells into different components by spinning themat very high speed. This crucial piece of equipment can exert a force that is close to 10,000 times what you would feel in an aerobatic plane. It will allow scientists to study DNA, proteins and other cell components from people with neuromuscular diseases. A sterile workstation that allows researchers to grow and study human neuromuscular cells and tissues. This workstation has a large window with a small opening for a laboratory worker to insert their arms so they can manipulate the cells. It constantly blows air out, to keep human cells safe from bacteria and other contaminants. A system that uses multiple lasers to detect tiny pieces of cells called exosomes. Researchers at The Ottawa Hospital have discovered that exosomes floating around in a patient's blood may provide a simple way to monitor the progress of certain neuromuscular diseases. This technology could also help with evaluating new therapies in clinical trials. People with neuromuscular diseases such as ALS and muscular dystrophy will soon have access to cutting-edge research at The Ottawa Hospital’s new Neuromuscular Centre. 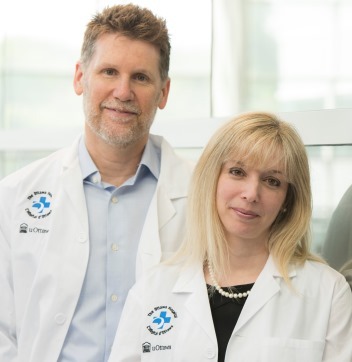 The centre, which opened at The Ottawa Hospital’s Civic Campus on April 30, is a hub for clinicians and scientists to collaborate and to develop new treatments. Ottawa boasts one of the highest concentrations of neuromuscular researchers in the world, including more than 200 scientists, clinicians, trainees and staff and is widely acknowledged to be an international leader in this field. Dr. Warman Chardon used to take the train regularly to Montreal, and she often saw patients with neuromuscular diseases travelling to take part in clinical trials there that weren’t available in Ottawa. Other patients had to travel to Toronto, London and even Miami. Research is built right into the new centre. There are designated rooms for clinical trials, as well as space for scientists to collect and rapidly analyze blood, skin and muscle samples. “The integrated care and research at the new Neuromuscular Centre gives us a glimpse of the cutting-edge health care that a new 21st-century campus will bring to Ottawa and eastern Ontario. Building a world-class centre right here at home means that fewer patients will have to travel for care, and keeps Ottawa at the forefront of patient care and health research,” said Dr. Jack Kitts, President and CEO of The Ottawa Hospital. The new centre is expected to provide world-class care for about 10,000 people every year with diseases such as ALS (amyotrophic lateral sclerosis, aka Lou Gehrig’s disease), myotonic dystrophy, muscular dystrophy and Guillain-Barré Syndrome.